Technology creates a vital role to creating the Impacts and robustness in the society via industries. As weather change and types of weather is required to control and available for human resources in normal conditions. in this situation one of the technology related to HVAC - heat ventilation Air Conditioning is high in demands in all over the world. The greatest part of this technology that its work both weather, either cold or hot. red people. 3D EDUCATORS is one of the organization which offers the specialized course of Certified HVAC and Refrigeration course in Karachi or Certified HVAC training course in Pakistan. The course is divided in to two parts and first part is totally belonging from design and load calculation through HAP Software and another Part is the based on HVAC Systems & Application. The course comprises from basic to advance level and its tools and techniques. After this training the candidate become skilled, He or She shall be certified internationally on HVAC and Refrigeration through IMRTC USA. Naveed Anjum is a seasoned professional having more than 10 year experience in delivery of design, operation and construction management of HVAC and related systems. He has completed more than 50 high profile projects in Pakistan and Middle East with special emphasis on core design functions. He has been associated with HVACR industry with a key position leading a team of engineers to deliver quality projects and solutions to industrial and commercial engineering sector. He is an expert in HVAC analysis and design software applications converging to real time project models. "The Candidate Should be Inter Pass or working in any the field of HVAC and Refrigeration Works at any office. It is recommended that professionals can join this training who are already working at any office and have some knowledge of HVAC work. " o The people who are involved in the HAVAC Works and like to use and develop their skills as Technician and want to become certified HVAC Level 1. This program is professional cadre program. The most important aspect of this Certification is to have complete set of knowledge at any domain of the organization. 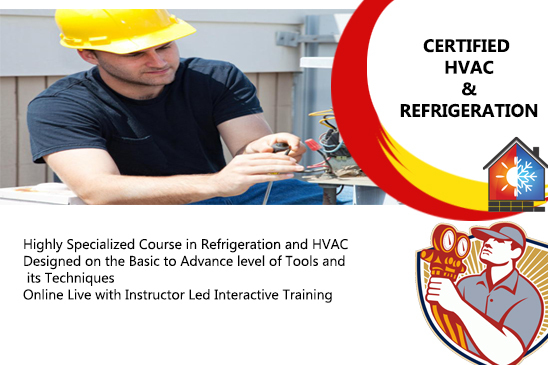 This training will equipped the participants with the latest techniques of HVAC and Refrigeration work . Group Based Learning techniques would be used to facilitate the participants with Live Projects. The Certification shall be awarded from 3D Educators. The program is totally practical based and participant will be more equipped and trained in respect of HVAC technology. Therefore, the option and opportunities are opened in the world and you can excel in your career after this training program. As mentioned above the certifications are most important part now in the professional world. Especially in the field of IT, you cannot survive, if you don't have got the International Credentials with you. All big organizations Offer the different Certifications that accredited you in the professional world. 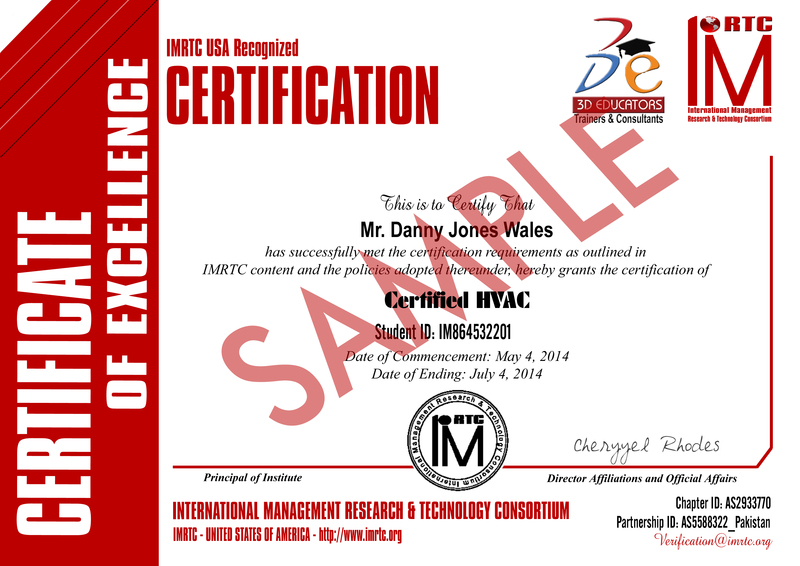 This is further clarify that HVAC Certification Shall be finally given by the International Body from USA IMRTC - International Management Research and Technology Consortium. The Certification holds the unique identity of the candidate, which can be verified through their official website http://www.imrtc.org.